My "Weekly Haul" this week ended up consisting of Superman #11, Aliens: Life and Death #3, Reborn #2, and Cave Carson Has a Cybernetic Eye #2. I may get into those tomorrow or Friday. But, indulging in some negativity and ranting (this is my own blog, after all–read it or not, completely up to you!) here are several things I didn’t buy, but considered buying, almost bought, or under other conditions would have bought…and why. 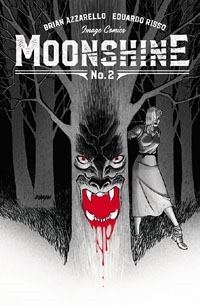 I picked up Moonshine #1 last month to try, and for what it is, enjoyed it enough that I’ve been watching/waiting for #2 to come out. It’s finally out this week (Oct. 5 for #1, Nov 16 for #2…that’s about SIX weeks, no?) Thing is…it’s a brand-new series. New series, new creators, not spinning out of anything, hasn’t had long enough to really develop or have any "in jokes" or (to me) any real iconography or symbols or other stuff to warrant any relevant/useful/interesting/cool variant covers. But there they were on the shelf, two covers that–at least at the shop I was at–sat there in equal-ratio. So, just looking at them, I saw nothing overly obvious to indicate which was the "main" cover, the "A" cover, the "primary" or "basic" cover…in short, which one was NOT the "variant." In searching for suitable images to use for this post, I’ve narrowed it down to the one with the skulls as being the cover I’d’ve gone with–and that was the one I’d added initially to what I had in my hands to purchase. But whether it was there or not, I did not see anything to indicate which should be which…and I refused to stand there in the middle of the shop, googling on my phone to try to determine an answer…but I also was not going to suffer buying a variant when I want to have the "regular" cover. So, I wound up saying "screw it!" and put ’em both back. 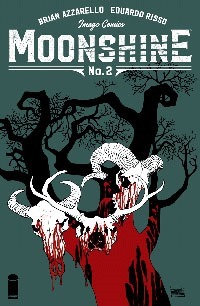 Because of a variant cover, a series I was otherwise trying, interested in, willing to give a chance to–I opted NOT to buy #2, and as such will NOT be buying ANY OTHER single issues for. Hope it’s worth it, folks. Maybe I’ll buy the collected edition, which presumably will have a single cover. But even there, for throwing a random variant in there, you’ve cost yourself MY purchase, and MY goodwill, such that here I am giving your book more space and time pointing out the customer frustration with variants, and that you won’t have me (not that I matter, personally) playing any role in talking the book up positively. Here’s another one I’ve been looking forward to. I believe the "regular" edition of this should be out soon; a week or two, perhaps, yet. But what really turned me off about this (and I was sort of surprised to see it out already instead of being held back til Saturday) is the cover. That is, the "sketch" cover. THe lines-only, without cover, except in the trade dress and credits. See, I don’t get why people like these. (If you do, more power to you–I simply do not get it!) To me, it looks like a draft, and unfinished product, an inferior product. It’s not finished, it’s not the intended edition, etc. So while I’d’ve been willing to plonk down full cover price for this thing in-person, in general…I was NOT willing to do so for an inferior cover. Yeah, it’d almost certainly be on my shelf spine-out and I wouldn’t even SEE the cover most of the time. But when I’d pull it down off the shelf, I’d see it, and I’d be treated to the unfinished image at that point, and reminded of the sheer ridiculousness of it, when I can simply wait a week or two and get the full color cover edition, which is the actual product, and actually has the cover to grab attention and attract one to reading it. I should have been a prime mark for this book. 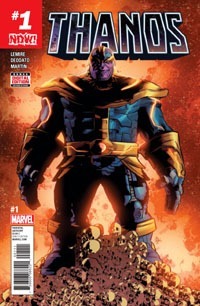 Thanos, and it’s a #1, so supposedly a jumping-on point, right? But this is Marvel. And at this point, I don’t trust them. Yeah, I could buy the issue, but is this a 6-issue series? Or 12? Will this be partaking in events before issue 10? And then, there’s that shattered NOW! thing, recycling an initiative from just four years ago. And that big #1 in the upper left corner, but then a small white #1 down near the Marvel logo and UPC box, as if to clarify "yes, this actually IS a true #1, this is not one of the issues we’re trying to TRICK you into buying as a #1 when it’s really a #7 or #18 or some other such!" 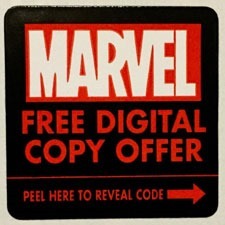 Further, there’s the fact that I’m not interested in buying any Marvel #1 issues for $4.99! That is way too freaking much for a single issue, padded/"’bonus’ material" or not! Oh…well, this is "only" $3.99? Yeah, well, it’s seemed all the other #1s have been $4.99, and Marvel has been very clearly conditioning and "training" me into the SIMPLE "assumption" that ALL of their #1s are $4.99…so sure, it’s a "surprise" when it’s not, but I still have the other stuff above counting against it such that $1 less than assumed price is not a great selling point–this is STILL $1 MORE than grabbing a random DC Rebirth issue! There’s also the odd mix Marvel has lately of stuff ignoring enough continuity to be frustrating in general to one who greatly enjoys continuity (at least 1980s into early 2000s) and yet being so stupidly tied-into stuff as to feel impenetrable if one has not been closely following recent events. Flipping through, I caught what looked like Thane, who I believe is a "son of Thanos" or such from Infinity (an event/crossover I did not and have not read) and thus another aspect of things I am actively disinerested in. Perhaps most "petty" of me…this is not a Jim Starlin book, and I much prefer his take on the character, if only for some sort of internal consistency that I (again) do not trust Marvel to maintain in general at this point. So, I walked out with my four comics that did not frustrate me on sight. Superman #11 had a variant cover, but the bulk of the covers present were the same–the one I got–and the other cover I couldn’t even tell what the image was supposed to be, just glancing at it. On Cave Carson, I was able to use the same methodology: this cover had more of this than the other, and seems to fit the title better. And it’s at least an "established" (if decades-old-since-established) property and not a brand-new-concept-characters-universe-everything kinda issue. Aliens is an Aliens comic, the 3rd issue of a stated-up-front-on-the-covers 4-issue-miniseries rather than something being cancelled before telling its intended first story or such. And Reborn #2 only had one cover available on the shelf, so no "confusion" or wonder about what the "main" cover is. But as stated last week by Valiant‘s Dinesh Shamdasani, "we’d love nothing more but the industry is not set up for that" [having only 1 cover per issue] and "must also remember that while we both may not like variants lots of people love them." Still, I’m obviously a clear case where having variants is a detriment, and that’s a couple of lost sales (magnified the longer Moonshine runs) and whatever else spills out of that. And thanks to crap with variant schemes and holding content hostage, I’m presently (since July 2015) refusing to purchase anything from Valiant, and since their stunt with Mighty Morphin Power Rangers #0 earlier this year, I refuse to touch anything from Boom! Studios, either. I’m rather dismayed at information I was given–by an industry professional–over the weekend. I rail against variant covers, as probably any reader of this blog knows. But now I have it from a major figure of a fairly major publisher that apparently, the industry is NOT BUILT FOR NON VARIANTS. @waltkneeland @ValiantComics @bleedingcool we’d love nothing more but the industry is not set up for that. We tried 1 cover with Mirage.
.@dinesh_s @ValiantComics @bleedingcool so the industry’s not set up for one cover per issue? Isn’t that a bubble waiting to burst?
. 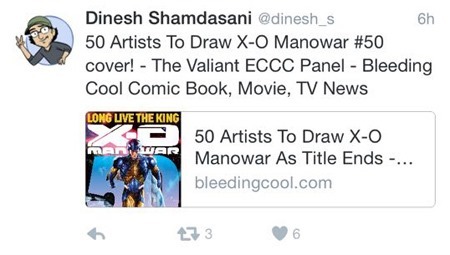 @dinesh_s @ValiantComics @bleedingcool shouldn’t effort be made to get away from that? Why perpetuate it? Especially with FURTHER gimmicks? @waltkneeland @ValiantComics @bleedingcool must also remember that while we both may not like variants lots of people love them. I am not, myself a publisher; I am not involved in that part of comics. All I know is as a fan, a customer, someone who BUYS comics, and has been REPEATEDLY "burned" by the use of variants and stunts involving the intentional screwing-over of longtime fans in interest of a short burst. I think it’s a bunch of crap that the industry "is not set up for that" [doing only 1 cover per issue]. THAT ALONE shows me the short-sightedness and HUGE PROBLEM with the comics industry. For a publisher to feel that they CANNOT POSSIBLY go with ONLY ONE COVER for a SINGLE iSSUE of a serialized comic book?!? "Trying 1 cover with Mirage" suggests (to me) a lack of commitment. It’s not like that’s a top-tier primary character from the publisher…so it’s not going to sell as well ANYWAY as, say, a more recognized property like X-O Manowar. So it’s tried with one issue (or 4 or 5, the entire mini-series?) of one series. That’s hardly lengthy enough to get the idea out there that quality stands on itself instead of just not selling as many copies as a bigger title that IS using variants. But both Valiant and Boom! have earned my ire (and specific avoidance + loss of existing purchasing in protest) over the variants and ratio-based shenanigans. I just have a really hard time getting my head around the notion that the industry is so ****ed up that supposedly it can’t support comics being published and standing as themselves, without Every. Single. ISSUE. having at least one variant! I guess I’ll be "interested" to "see" what "initiative" is being done for X-O Manowar, though at this point, it being Valiant, the publisher that is going back to making people clip coupons out of an issue and pay to mail those and shipping expenses to receive some "special edition" issue, and the publisher that sought to force longtime, loyal customers into being Valiant salespeople if they wanted to keep up with the "full story" of the comics universe…I can’t say I’m expecting all that much. Given I’ve seen numerous comic shops with multiple longboxes full of nothing but "variants"–an ENTIRE IN-STORE CATEGORY–obviously (to me, experientially) that means it’s NOT LIKE they’re ALL SELLING. SOME people MAY "like them," but not enough people to buy them all! And *I* think that if publishers would just give the darned things A REST and STOP IT for several months, take the "hit" of "lower profits" for the short-term, it might avoid as much likelihood of a bomb-out like the ’90s. That the entire viability of a publisher is predicated on variants, as if it’s an unconscionable loss to not use variants on every issue, makes me an official subscriber to the notion of the industry being in trouble. But hey, that must mean that I am just old. That I am not the target audience. Comics are no longer for me if I’m not willing to change and embrace the trend(s), right? Well, dear publishers (not just Valiant), where IS the mythical "new audience," the huge influx of "new readers" and such? When comics are among the worst value in entertainment, frustrating the people who overlook that week in and week out is (to me) not the best of plans. I don’t like being negative, nor causing random (negative) ripples or fights on the internet; I don’t like flame wars, I don’t like raining on others’ parade, etc. (That’s part of why I have this blog–I can simply put MY thoughts “out there,” but I’m not inserting them into discussion forums or other places in some consciously disruptive fashion). But for now I want to vent a bit, with several questions that have arisen and that I’ve wound up with photos to illustrate said questions (in the course of prepping photos for other blog posts). 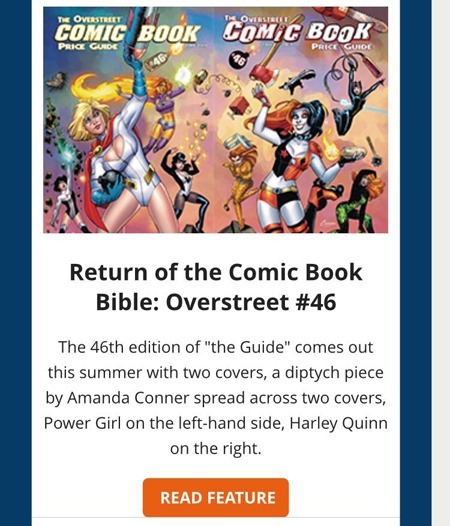 Who in their right mind is going to buy multiple copies of a reference book like The Overstreet Comic Book Price Guide?!? I mean, I am long used to their having multiple covers, but those usually seem (to me, in my memory) to be singular covers, just different artists and even focus on different publishers in subject-matter of the cover. Pick your favorite, so you’re not locked into a cover you despise, for a book you may be utilizing frequently for a year or more. That I can be ok with. What I’m not ok with is something like this, where on a freaking REFERENCE BOOK they’re taking a singular image and splitting it in half. Not even doing a wrap-around cover type thing, or some insert, or whatever. If you want the WHOLE of the SINGLE IMAGE, you have to have TWO COPIES of the exact-same, not-supposed-to-be-“collectible”-itself book. Needless to say, I won’t even be tempted to pick up this year’s edition as a replacement or “update,” and I’d be truly curious at the effect of this “diptych” cover stunt on sales (probably not much, since I’m just one person, and grumpy at that, and it seems very few people feel so strongly on stuff as I do). Why must there be umpteen to half a hundred variant covers rather than some sort of “art-gallery” special issue to “celebrate” a series/issue/milestone? Valiant is just digging its hole even deeper…this totally, completely turns me OFF to even the contemplation of randomly buying X-O Manowar #50 as a new issue! What ever happened to the “art gallery” issues? Publish some 50-page “issue” that’s nothing but cover images (with or without cover text/logos) as something like X-O Manowar: A Celebration of 50 Issues or such. Sell it as a poster book. something. How many people are totally turned off anymore to the constant glut of VARIANT covers? I would honestly be willing to argue that the last several years and present are far worse in terms of “variant covers” than the “Collector’s Age” of the 1990s ever was with variant/”enhanced edition” comics, with the “newsstand” and “direct market” covers. Yet another thing that will leave me willing to not even buy new issues, but go and be fairly content to drop twice the cost of a “new” issue on a random late-Bronze-Age comic from a back-issue bin. Why do book designs have to be ruined by “branding” on something that has had dozens to hundreds of books published in its course of existence? While I might otherwise have some interest in purchasing new Dragonlance or Forgotten Realms books; Elminster specific volumes or something with Drizzt…I flat out refuse to buy any such mass-market paperback with that ugly D&D “swish” on the spine. Frankly, I don’t “get” it–does anyone specifically read Dragonlance or Forgotten Realms books because they’re a sub-brand of D&D/Dungeons & Dragons? Speaking for myself–I sure do not. I’m interested in either property for the property itself, and I truly feel like these are marred by that “swish” on the spine. I can appreciate the “branding,” of wanting to promote D&D over an individual setting, but I absolutely do not have to like it. Nor, in that regard, do I have to buy any of the newer editions thus marred by the branding. What, exactly, is the POINT of the extra half-inch or whatever to have “oversized” mass-market paperbacks??? I absolutely loathe the things and refuse to buy them…and they can even put me “off” from a whole series of books if I’m not “chomping at the bit” TO read them. I’m trying to track down the hardcover edition of The President’s Shadow, having only just recently finally finished The Fifth Assassin. 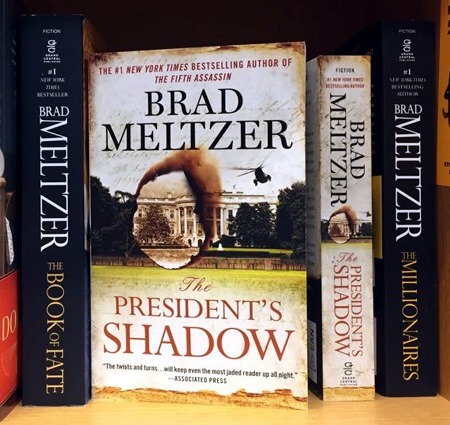 I’ve been getting Meltzer‘s books in hardcover since/including The Zero Game back in 2004 or so, so I don’t have much interest in the MMPB (I’ll get the e-book first, honestly). But even if I was interested in the MMPB, seeing it on the shelf like this, next two a couple of the earlier books simply reminds me that even if I switched to paperback, it’s impossible for me to have a complete set of his books that actually go together on the shelf, without at least a couple of the more recent/”middle” ones sticking out like glowingly-red sore thumbs, having been released in the “oversized” format. And despite that, now they’re back to the “regular” paperback size…so there doesn’t even seem to be any commitment to one or the other, thus there isn’t even consistency to the books, whatever format, regardless of my liking them or not. In a time when buying a movie shortly after initial release costs a premium and it seems fairly routine for prices to drop within a few months until it’s on the bargain racks within a year…does Disney truly sell more keeping the higher price, or would people who’d buy it at a lower price continue–like me–to pass on stuff? 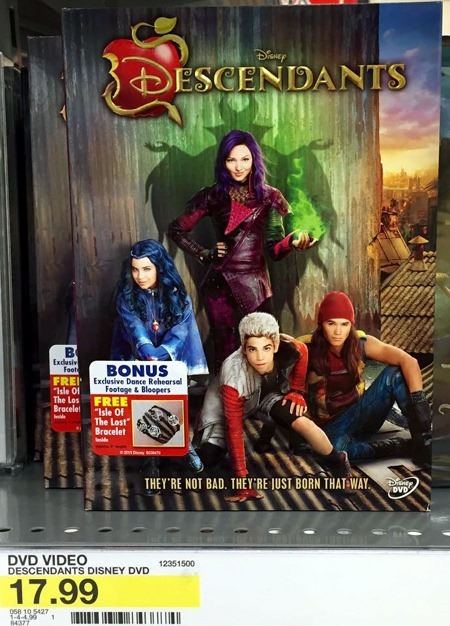 Loosely, conceptually, I’m very interested in this Descendants property. I love “legacy” characters, seeing a universe expanded on, digging deeper into stuff I’ve already enjoyed…and thus, I was originally looking forward to the home-media release of Descendants last year or whenever it was. But the thing was not “on sale” for the “week of release” if I noticed it then, and I have been unwilling to pay the whopping $18 for a 90-minute “tv movie” that I know darned well is gonna be cheesey and hokey and more of a “guilty pleasure” than much else. And month after month after month, I have never seen the thing on sale such that I’d be willing to purchase it. I think it might have once been “on sale” for $16.99, but $17 vs $18 is negligible for me compared to $15 or $13 or even $10. $15 would be seriously pushing its luck, $13 a bit more reasonable, and at this point, $10 ($9.99) would be ideal. And this is at Target and Walmart, to say nothing of other retailers and such. To me, the $17.99 is an odd price–more expensive than the $10-15 many movies cost, but not quite the “premium” $19.99+ units. Yet, this definitely is not something I would ever pay $20 for…and negligible as it may be if one’s got the money available to spend on something like this, I’m not paying the extra $3 just on principle, beyond the $15 or $14.99 I’d otherwise have been willing to pay. And with this stuff outta the way, back to the usual content, most likely. I continue to “find my comic book joy” in 1990s 25-cent issues, and increasingly in the notion of actually hunting down late Bronze Age comics. Contemporary comics–at $3.99 and increasingly $4.99; characters and properties being driven into holes into which I’m uninterested or unwilling to follow; variant covers in general…as publishers strive for some mythical “new readers” audience and increased month-over-month year-over-year and other buzzwords sales in a modern market…they just keep putting me off entirely to their product(s). I’m still sorely burned by Valiant over last year’s Legends of the Geomancer crap–burned, and still have not forgiven or forgotten. 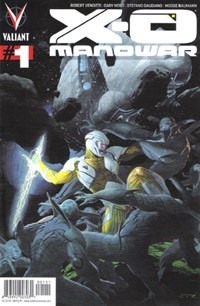 But I’m rather saddened to learn that apparently the current volume of X-O Manowar by Venditti is going to end at #50. 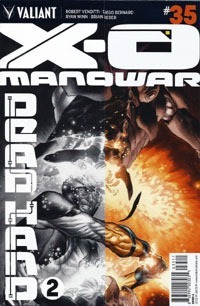 With several specials/one-shots and an annual, about 56 total issues of X-O Manowar. But that leads into the bigger problem for me: it solidifies that there is no point whatsoever for me to buy Valiant single issues! If it’s WORTHWHILE, it will be put into a "graphic novel" or collected volume and I can get an entire story in one go for a similar price, but without the wait, the variant covers, and all the crap involved in that whole side of things. If numbers don’t matter or it’s "just a number" that’s replaceable and nothing is truly intended to be any sort of longer ongoing series with any real individual HISTORY…then there is no INCENTIVE for me to buy the single issues…especially not for $3.99 an issue, with the flimsy paper and often slightly "off" cuts and such (stuff I overlooked while they were on my good side, but just one more negative point once they burned me). 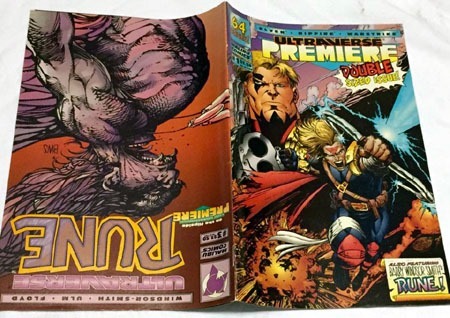 The "numbers problem" applies across the board, though–who would have EVER thought that SPAWN would be THE highest-numbered uninterrupted/non-rebooted American comic book being published in its time? (Though Action Comics and Detective Comics are "returning to classic numbering" this summer, their numbers are no longer pure because DC is counting 52 issues of the New 52 series as if they’d been sequentially-numbered issues of the continuing series for both). Though I bailed on Valiant entirely last summer, and even got to where I was disgusted looking at my "new-Valiant" hardcovers in light of stuff…there was a part of me that still hoped to see something like X-O Manowar actually make it to some number above 50; maybe make it to 100. Perhaps it’s the "changing world" of comics, and the "seasonal model" that Marvel especially seems to have adopted. Maybe it’s what I was already feeling was Valiant‘s own "spin" on stuff–that they weren’t "canceling" titles so much as cycling the properties, rotating stuff to keep things fresh. Whatever. On the whole, there’s a continually-decreasing incentive to buy monthly comics…between price point, enjoyability, and the constant renumbering by publishers seeking the "in-the-moment" bump of sales that #1s seem to get. And whatever my positive feelings are for Robert Venditti (to whom I wish a long, continued successful career in comics), as far as Valiant itself goes, for me, this is another push away from their product, at least in monthly form (which is not good, if the monthly books are truly the absolute, core "lifeblood" folks claim they are in terms of anyone opting to "wait for the trade" or such). If the X-O Manowar Deluxe Hardcover volumes are collecting about 14 issues apiece, that’d work out to 56 issues across 4 volumes…I can’t even recall if I got as far as getting the second volume last year, but while I might be inclined to eventually pick them up as a finite series, that does nothing for their monthly books. I’m glad I’m not trying to be or be in charge of a publisher and having to make whatever decisions. But simply as a fan and NOT considering whatever focus groups or statistics or whatever… I’m annoyed and put-off by the constant variants, constant renumbering, constant spin; in this publisher’s case particularly I’ve also been burned by their 1:25 "incentive content" stunt last year…so, I bid farewell–again, and from afar–sorry to see the title go. And sorry that it’s more reason for me to continue to stay away from the publisher’s product, as I still haven’t seen anything since walking away to truly be incentive to return. Three months post-Legends of the Geomancer, and with having dumped Valiant entirely from my pull list, I’m finding myself buying other stuff as I continue to support the local comic shop–just not via Valiant‘s offerings. This week, I snagged an old Superman vs. 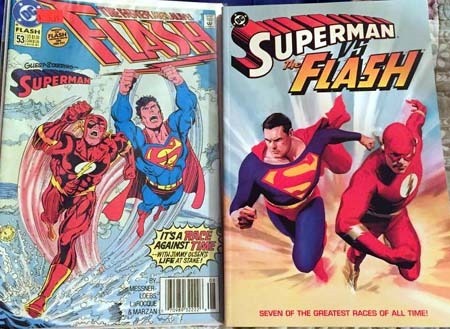 The Flash for cover price, and at another shop managed to find Flash #53 for the price of a standard contemporary comic. I was willing to pay $3.99 for it for the immediacy and specificity–I was seeking this specific single issue, hadn’t seen it in bargain bins, and it’s not like I often see the Flash in quarter bins anyway. I wouldn’t be (able to be) buying the back issues and collected volumes I have been lately, had I not been "freed" from the weekly Valiant expenditure…though in some weeks I think I’m actually spending a bit MORE, but I’m "affording" stuff I would NOT be able to ON TOP OF buying Valiant. I can only say thanks, Valiant. It’s been an interesting week with several things ‘converging’ for me: a forgotten pre-order item, a purchase substituting for a convention, and my largest single “back issue” purchase ever. First off, last weekend I happened to to see a link on Facebook to some group called Something Valiant. I clicked through, and found some stuff involving classic Valiant stuff, so did not immediately click away. 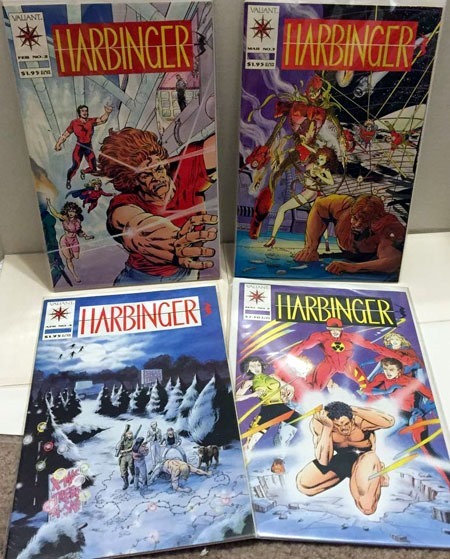 I noticed a post offering Harbinger #s 2-5 for a very reasonable price, shipped–and messaged the poster to inquire if they were still available (not seeing any comments on the post). They were, so arrangements were made. Easily my biggest “back issue” purchase in this regard–for what I paid for “only” 4 issues. However, considering I’d expected to pay significantly more per issue and not get them all but dropped in my lap from one source, I’m very happy with the purchase, and will certainly reach out to this seller again in the future as I whittle down my “missing” list of classic Valiant. 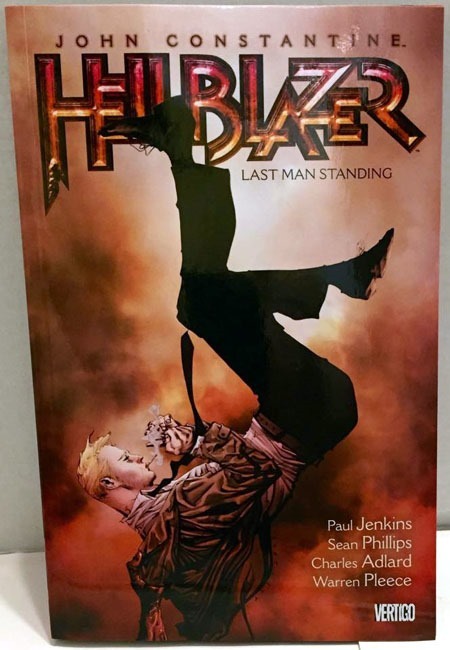 Another surprise arrival this week was the new Hellblazer volume. This is the 11th volume in this incarnation of the series, reprinting it from its start including key tie-ins and such, and incorporating a numbering so it’s not just a bunch of random volumes. It turns out that I apparently had pre-ordered this from Amazon several months ago and forgot about it. So when it showed up, it was a very pleasant surprise. I continue to be quite impressed with the size of these volumes, particularly for the cover price. Though this would easily be a $40+ volume from Marvel, this one carries a $24.99 cover price…and thanks to Amazon I got it for less than $12. Though I grouse about Marvel‘s pricing, they make up a significant chunk of my graphic novels collection due to various clearance and blowout sales and such through the years, as well as having a lot of stuff I’m truly interested in. 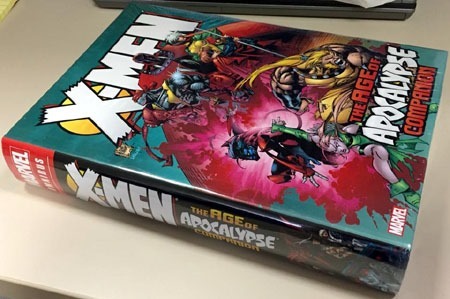 A couple years ago, I was quite impressed when I came across the X-Men: The Age of Apocalypse Omnibus at Carol and John’s. It was very far out of my price range, though more recently I’d lamented realizing it was out of print, and so had been jacked up astronomically beyond my price range by “third party sellers.” So when I more recently learned of the Age of Apocalypse Companion I didn’t even consider pre-ordering it from anyone…no sense having the companion volume without the main. 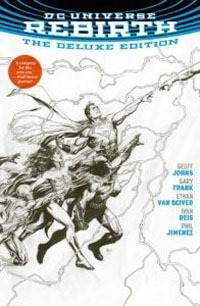 I was listening to a recent episode of the Collected Comics Library and learned that there’s to be a new printing of the main omnibus in the first part of next year, in time for the new movie. So, rather than beat around the bush and put it off, I found a mostly-reasonable price online and bought this volume, knowing I’ll be able to pair it up in the spring (and for what that’s gonna cost me, I certainly would not want to be trying to buy TWO omnibii nor “risk” this one going out of print!). Plus, I had decided that I was not going to be attempting to attend a particular convention I had been considering, so with gas money and admission I would not be spending, as well as other random purchases I would not be making…I was able to justify (to myself) this rather large singular purchase. 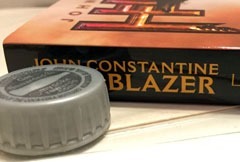 If you look to the right in the photo above, you’ll see a quarter leaned up against the volume–showing just how thick this companion edition is. And below, it currently has a place on a shelf with the last Omnibus I’d bought, as well as the recent TMNT by IDW hardcover. 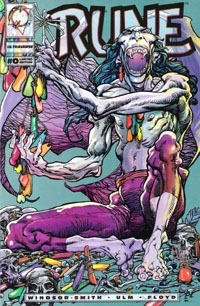 Legends of the Geomancer #1 was offered–as an entirely unique issue–cover, content, everything–on a 1:25 ratioed basis to retailers, based on the quantity of Book of Death #1 they ordered. 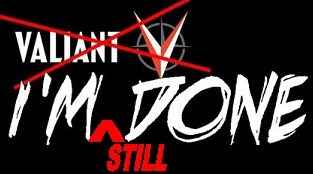 Things did not have to be that way–the content did not have to be held “hostage” to force fans to do the legwork of the publisher in trying to convince a local retailer to order more copies (that they probably would not be able to actually sell on through to other customers) of Valiant‘s latest event series. Here are some alternatives That I can come up with–some based on recent things, others also rooted in the time of the original Valiant (the 1990s)–that could have been used as a means to make LotG a special book, a prize for collectors and an incentive to die-hard buyers-of-such-things WHILE allowing a basic/standard copy, the CONTENT–to be easily accessible to those who just want the complete story and do not care about variants and other such things. There are several ways that I can think of–offhand–that would involve digital codes. 1. 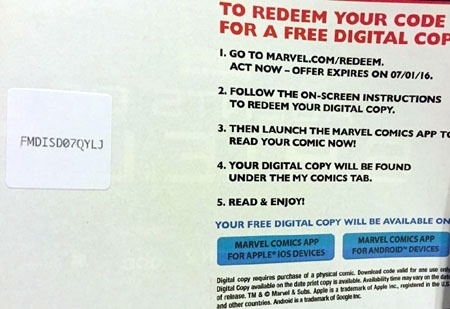 Get a code in BoD #1 and “combine” it with a code from ANOTHER Valiant book published in the same month. Go to a website, key in the codes, pay s/h, get 1 copy of Legends of the Geomancer. 2. Get a series-specific code, and combine one code from each of 9 or however many series, pay s/h, get 1 copy of LotG. 3. Some other combination to ensure LotG is rarer than any single issue, but someone buying multiple–or all–Valiant series would have no problem getting it, and would get different issues’ content rather than buying tons of copies of one specific issue. There are several ways I can think of that would involve bulk purchasing to get more copies of stuff out there for Valiant. 1. Make a bulk pack of 10, 15, 20, 25 copies of BoD orderable as a single line-item/SKU, priced at whatever the bulk/discount/eligible-for-returnability cost is for retailers. $19.99 or $24.99 or whatever. This shrink-wrapped/bundled pack would include 1 copy of LotG . The fan now has 10+ copies of the issue–they can give it away to their non-LCS-going friends or other channels, hoard them, or “give” them to their LCS to sell. 2. Make a bulk pack of the entire month’s books available at the end of the month that would include LotG . This might also logistically tie to codes for redemption. 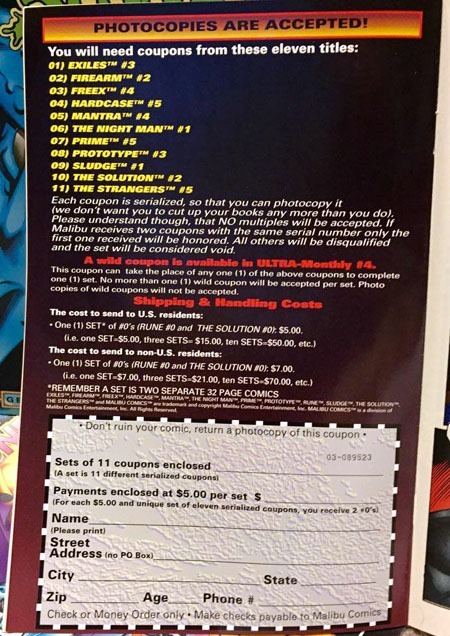 These would either allow a fan to have ordered a PACK of comics including LotG without otherwise having to make special arrangements with a comic shop or to just order a pack of that month’s books. If a shop ordered the packs–for fans or for LotG it would get some titles onto the shelves that might not otherwise be ordered, yet would not screw the fans. 1. Make LotG a flipbook with BoD. For the 1:25, LotG is orderable as its own standalone issue. 2. Make LotG a segmented flipbook, with 2-3 page segments on the backs of the entire month’s worth of Valiant comics. Buy 1 comic, get a short segment. Buy them all, you functionally have an entire issue. For the 1:25 to BoD, retailers can order LotG as its own standalone issue. 3. Have LotG as a standalone issue, and 1:25 BoD there’s a flipbook edition with BoD and LotG combined…maybe an overlay cover or varied cover image for this edition. This would allow for the creation of a unique edition/comic that would appeal to collectors as an incentive item yet allow someone otherwise soley interested in the content/universe of the story to also access that without being forced to a secondary market or otherwise far out of the simple enjoyment of getting their books as they have for nearly 40 months. 3. Have LotG as a standalone issue, but if a fan sends in a photo of BoD and other Valiant issues on display at their LCS, with a card/signed form that the shop did the display because of/with the fan, get a Gold edition of LotG . 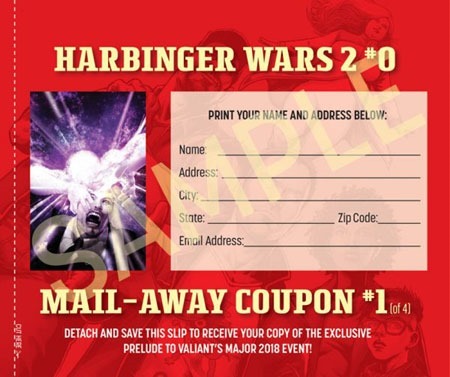 This would reward retailers/fans for putting forth extra effort to promote Valiant while not interfering with fans who just want the content. 1. Have LotG as a standalone issue, with a 1:25 variant cover tied to BoD. Let the market do the work from there, if any. 2. Quit screwing around with variants and false/artificial scarcity and collectability and HAVE PATIENCE for the fanbase to continue to grow, and don’t screw loyal but casual-ish fans that DO buy everything but aren’t militantly evangelical about your stuff. Though ultimately, this is all a moot point–it won’t change the past, Valiant is not listening to me–and short of announcing LotG as something to be included in a Deluxe Edition hardcover, I’m done with buying their single issues, on principle. I’m just still curious–thoroughly curious–at the result of their little experiment and how stuff plays out. For better or worse, I get the impression that I am in an extreme minority with my stance, and not only will Valiant pull this kinda crap again, it’ll catch on with other publishers (like pullbox variants) and making content an incentive will be all too normal before long. 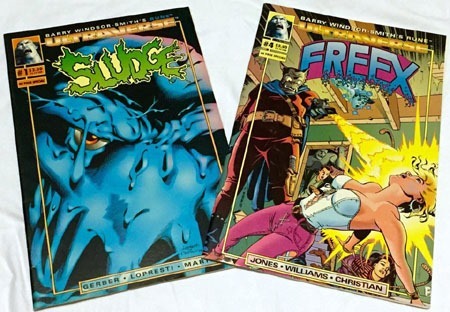 Above: Sludge #1 and Freex #4, 2 of the October 1993 Rune month flipbooks. 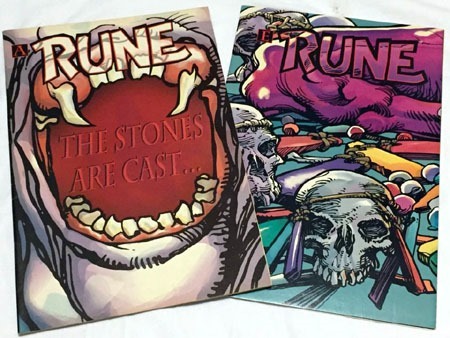 Below: Flip the books over for a chapter of Rune #0!